Italy has always been near the top of our travel list, particularly when we moved to Europe, but we always felt it needed to be done slowly. While there are cities that would make great weekend trips, we wanted to tackle Italy as we had done Spain a few years prior. (That is, taking a couple of weeks and visiting a handful of locations without feeling really rushed.) We knew that Joe would be able to have holidays around Easter this year and with that being Norway's biggest holiday (fyi, Norway has the world's longest Easter holiday - no joke,) it made perfect sense to schedule in Italy. I had been to Italy before - I was 16, the lira was still in use, and while I visited Florence, Rome & Pisa, the memories outside of Mango, Zara & a discotheque are vague. Joe was pretty open to anything but probably most keen to see Florence (Dan Brown inspired.) 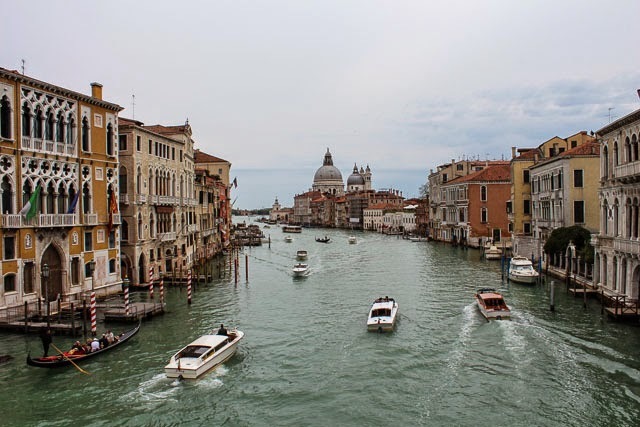 I was eager to check out Venice and hoped for a relaxing portion on either the Amalfi Coast or Cinque Terre. After perusing the map, a rough plan was put into place. 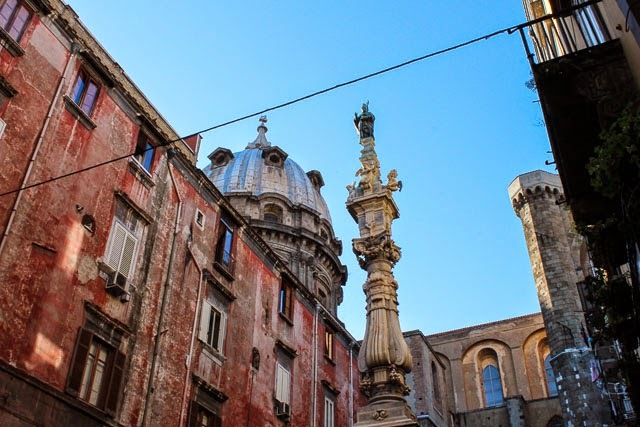 There is so much of Italy to see and had we had more than 11 days, we probably would have added to the itinerary but I'm an advocate of taking things slowly. It's really difficult to get a feel for a location when you rush in and rush out in a day or two and I'd rather visit less and feel more comprehensive about what we did see. 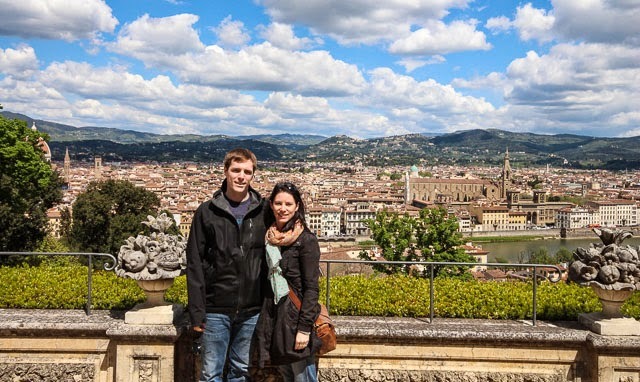 That meant for this trip, we wouldn't spend a few days in the Tuscan countryside and Joe wouldn't get to see Rome. :: We flew from Stavanger to Venice via Frankfurt with Lufthansa and arrived late, Friday evening. :: We stayed at the Carnival Palace hotel which we both really enjoyed. We were so happy to be located away from the main tourist crowds and the property was modern and clean. We also loved the complimentary prosecco available at the breakfast bar. :: We originally thought we'd spend one day exploring Venice proper on foot and boat and then use part or all of our second day to visit the islands, Murano & Burano. In actuality, we loved getting lost in Venice and decided the islands would have to wait until our next trip as we wanted the full 2 days to really explore the city. :: We took the high speed train from Venice to Florence. I had heard not very nice things about the local rail system in Italy so I was a little nervous but the high speed trains were really fantastic. They were clean, comfortable and efficient. The trip took 2 hours and left us in central Florence, within walking distance to our accommodation. :: We strayed from our usual boutique hotel and went with the most charming garden loft on a large property right in the city. The history of the property and the family that owns it is fascinating (and will most likely be a post all on it's own) and the loft was really unique. Also important, it was well located with an easy walk to the River Arno and many of the historical sites in the city. :: Our three days were spent wandering the city on foot. We had a few sites that we were keen to see but because the weather was so great, we didn't want to be holed up in museums. Both of us felt ready to leave Florence at the end however, if you're really keen to visit (and enter) all of the historical sites, you might want more time. Florence is crazy with tourists and the lines can be long. :: We stayed at the Punta Regina which is a small hotel (only 18 rooms) located partially up the mountain but still within Positano and about a 10 minute walk down to the main beach. We were really happy with the location as we had great views, there were several good restaurants nearby and the walk into town was really nice. The hotel itself was great. Our room had a huge private terrace and the rooftop area where we had breakfast was lovely. (There was also a small pool up there should you want to take a dip.) Best of all was the service. Never once did we have to give our room number and when we asked for recommendations, it was all really personal and helpful. :: We had four nights in Positano but we really would have loved more. We had enough time to slowly cover the area including side trips to Amalfi/Ravello and up to Nocelle (a tiny little village above Positano.) However, we didn't have enough time to get to Capri or do the Path of the Gods. A couple more days would have been perfect. :: Our return flight to Stavanger was at 6:45 am so driving in from Positano really wasn't our best choice. Instead, our private driver drove us back to Naples. On the way, he stopped off at Pompeii for us where we had a couple of hours to tour the ruins. :: We stayed at La Ciliegina which was kind of in the heart of Naples. It's another tiny hotel but the rooms were spacious and the bed, one of the best we had in Italy. -Train tickets for the high speed trains can be bought online at ItaliaRail. There are a few different price categories (aside from first class and economy) that are released. The earlier you book, the better chance you have at getting the lowest fares. -I pondered upgrading to first class (it's so much more affordable on train travel than it is on air) but I'm happy we decided against it. The economy cabins were fine (although short on space for large luggage.) Pack snacks with you as the quality in the food car was sub-par. -Spring travel was perfect in Italy. Most days were in the high teens, early twenties (Celsius, of course) and there was very little rain. 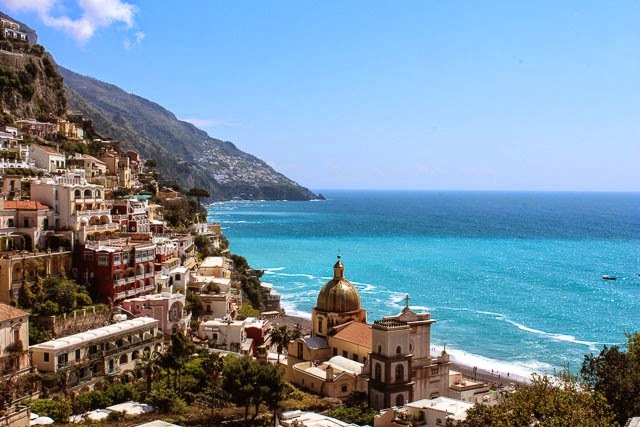 -If you're hoping to lay on the beach in Positano, I'd wait to visit until mid-May or June as it was cooler on the Amalfi coast than it was in the other spots and just a bit too chilly in April to lay out in a bathing suit. I really hope to get my blogging act together (although truth be told, the non-stop sunshine in Stavanger lately is making it difficult.) On our trip, I found myself thinking about this little online space and sharing all we were experiencing. I'm hoping to cut out some more time to work on photo editing and writing as I really don't want to forget the details of this perfect, Italian trip! A couple of weeks ago, Joe had meetings in Oslo. It's normal for him to fly to another Norwegian city for business here and there but often it's just a day trip and usually it's in the middle of the week. We used to hope for the meetings to partner up with a weekend so that we could go a little early and I would be able to tag along but it rarely happens. When the meetings came up on a Monday and Tuesday, we decided we'd better take advantage of the opportunity. The weather in Norway has been so fantastic lately. I know, for those of you in much of Canada and the Eastern US, you're shaking your head at me but I can't help but be ecstatic over the arrival of Spring. This winter was really hard on both of us; the daylight hours so minimal and the multitude of wind storms took it's toll but I'm convinced that all of that just makes us appreciate the arrival of the next season even more. As we looked ahead to the forecast during our time in Oslo, we were both so excited to see the city above zero with clear skies. It wasn't an exciting or a big trip for us but the change of scenery was really welcome. Joe's been having a particularly hard time at work lately with tasks piled so high that he hardly takes a break for supper before getting back to the computer until bedtime. While in Oslo, he was able to work Norwegian hours. (I mentioned here before that there's a strong worker's union in his industry which limits working hours and no one works overtime. A day is 7.5 hours and it's uncommon to take work home. While I wish it applied to Joe, as an expat, there are several shades of grey and he doesn't get to reap those benefits.) I hadn't been feeling well and had sort of holed up in the house taking it easy on my body which was needed but I certainly was ready to get out and Oslo was the perfect excuse. 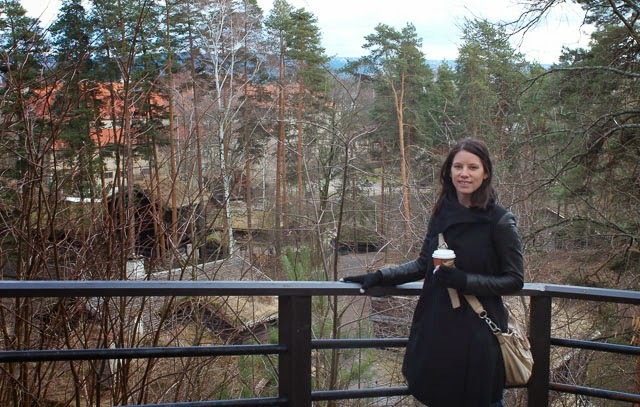 Our last trip to Norway's capital city was at the beginning of February and it was cold and icy. It's quite amazing how one can see a city so differently through a different season and while Oslo failed to impress us our first time around, we did warm (figuratively and literally) a little to it this time. 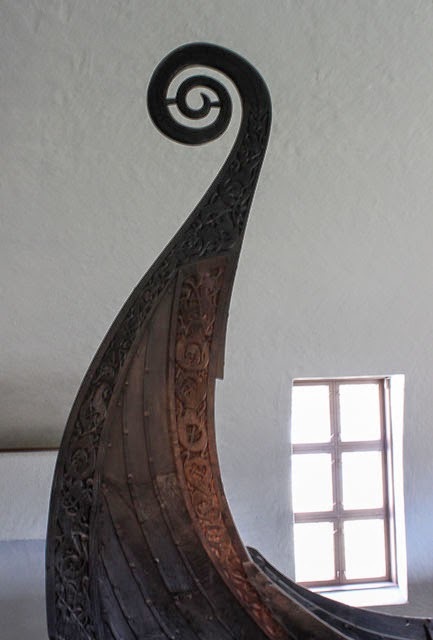 While in town, we finally made it to the Viking Ship Museum. 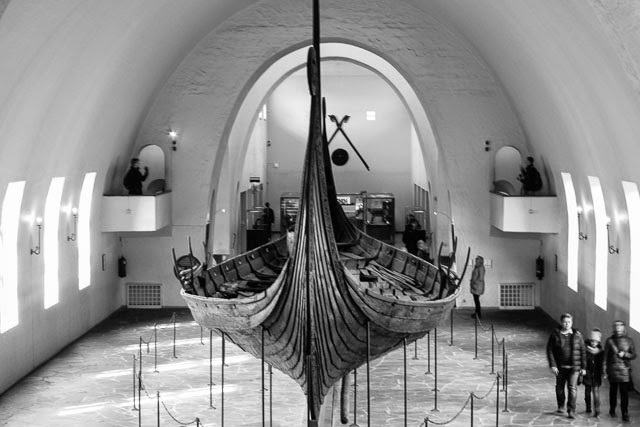 While these ships were well-known to be used on the water, they were also used in burials in Norway. The ship pictured above was brought ashore in 834 for two wealthy women, filled with goods to be used in their next life and became their burial chamber. 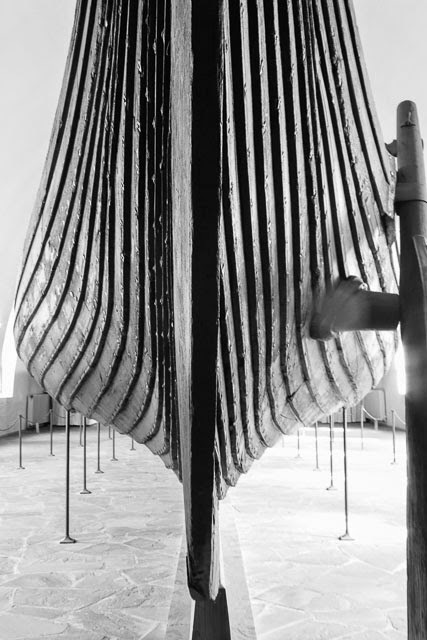 Over 1000 years later, the ship was found by a farmer on his land and excavated in 1903.